THIS JUST IN: Sylvester Stallone has won Best Supporting Actor for the Rocky sequel/spin-off Creed at the 2016 Golden Globe Awards! While we're congratulating the cinematic icon for his much-deserved victory, Sly already won at the awards ceremony before it even started. Earlier, at the event's red carpet, the 69-year-old actor turned heads when he came with his wife Jennifer Flavin, and their three daughters Sophia, Sistine, and Scarlet. 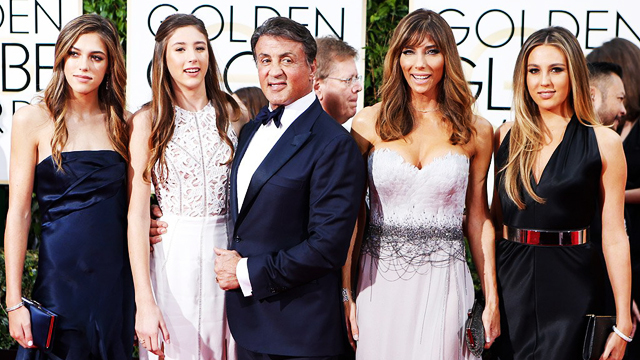 Our takeaway: Stallone and Flavin have great genes, judging from their stunning offspring. Nineteen-year old Sophia Rose is currently a college freshman at the University of Southern California, and is apparently a member of the Delta Gamma sorority, based on her social media accounts. Meanwhile, Sistine Rose, 17 (turning 18 on June 27), is attending Notre Dame High School, while pursuing a career in modelling. The youngest, 13-year-old Scarlett, has scarce information on her, given her private social media accounts—the only thing we're sure of is that she will grow up as beautiful as her sisters. Anyway, before we completely veer off the good news, having pretty daughters or none, hats off to you, Sly.